Garmin G5 Experimental/LSA Electronic Flight Instrument w/Battery/Conn – Lafayette Avionics, Inc.
G5 may be installed with a GMC 305 or GMC 307 autopilot control panel and up to 3 GSA 28 smart servos to perform as a standalone flight instrument with integrated autopilot functions. 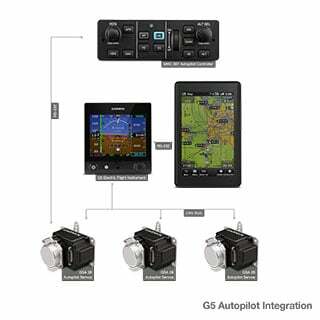 In addition, the GTN™ 750/650 series2 (and legacy navigators2) or a Garmin portable GPS such as aera 660, aera 795 or aera 796 may be connected to the serial port on G5, enabling the autopilot to couple laterally to the flight plan and vertically to support VNAV descents to pattern altitude. Other lateral and vertical autopilot modes selectable from GMC 305 or GMC 307 include heading, pitch, roll, altitude hold, vertical speed hold and airspeed hold. Even the control panel’s level (LVL) mode button is supported to engage the autopilot and restore the aircraft to level flight at the press of a button.